Shakespeare Garden is a four-acre landscape named for the famed English poet and playwright. The garden features flowers and plants mentioned in Shakespeare’s poems and plays and is designed to resemble the Bard’s native English countryside. The garden’s diverse array of plants, including columbine, primrose, wormwood, quince, lark’s heel, rue, eglantine, flax and cowslip, are accompanied by small plaques featuring quotes from Shakespearean works that reference the garden’s flowers. The garden was created in 1913 by Dr. Edmond Bronk Southwick, who was both the Parks Department entomologist and a devoted reader of Shakespeare, at the request of Parks Commissioner Charles Stover. In cooperation with the Board of Education, Southwick carefully plotted the bulbs and seeds that would bring the garden to life. In 1916, the garden was officially renamed Shakespeare Garden and dedicated to the memory of William Shakespeare on the tricentennial of his death. In its early years, the Garden was maintained by Dr. Southwick and the Shakespeare Society. However, after the Society disbanded in 1929, the garden began to cycle through periods of decline- much like the rest of Central Park. By the 1970s, the garden was completely overgrown, contained very little horticultural diversity, and lacked the inspiration and beauty of its earlier years. 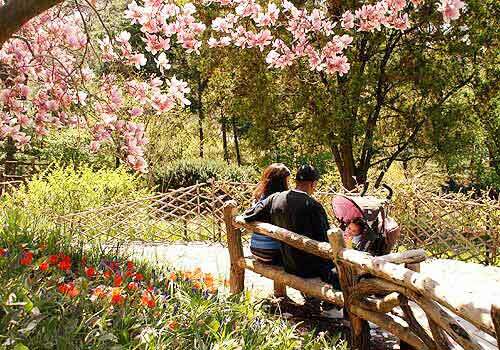 Thankfully, community volunteers began to clean up the garden in 1975, and the then nascent Central Park Conservancy oversaw a complete restoration of the Garden in 1987. The restoration included replanting the garden with fresh plant life, expanding the garden, repaving paths, installing rustic wooden benches and fences, and adding bronze plaques with Shakespeare quotes. With generous support from the Samuel & May Rudin Foundation and the visionary design of Bruce Kelly and David Varnell Landscape Architects, the garden was then returned to its original splendor. West Side between 79th and 80th Streets.